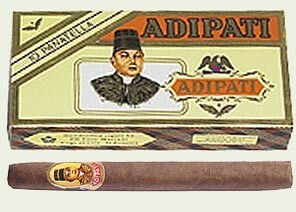 Adipati cigar is one of the world greatest and finest cigar from Indonesia. Adipati cigar is made from 100% tobacco leaves from Sumatra island and the taste of the pure tobacco can be recognize in this premium cigars. Adipati Panatellas are a long classic cigar guaranteed to be a long classic smoke. Schedule an evening around them and find out.